The death occurred in Perth last month of Laurie Russell, following a long illness. The funeral was attended by many lovers of singing and admirers of Laurie’s many skills – including John Christie, David Macgill and Bruce Okely. Very few in the Australian barbershop movement would be aware that, had it not been for Laurie’s initial enthusiasm, there might not have been such a movement in Australia. Laurie, as the founder and leader of a quartet called The Four Notes, was largely responsible for the fact that the quartet, and their wives, attended the 1984 Convention of the Society for the Preservation and Encouragement of Barber Shop Quartet Singing in America (Inc), held in St Louis, Missouri. The other quartet members were John Little, David Macgill and Bruce Okely. 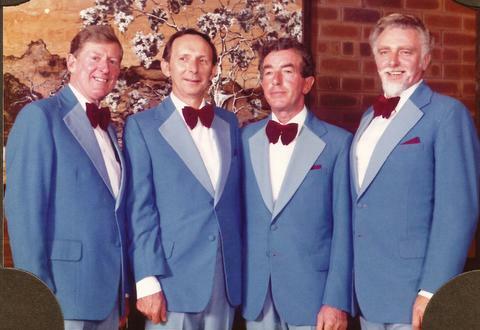 When they returned to Perth the latter three, full of enthusiasm (and only a limited amount of knowledge of barbershop) set about forming firstly, a barbershop quartet, then a barbershop chorus, which led to a State barbershop association, which led to the National barbershop association – currently known as Barbershop Harmony Australia. Laurie Russell chose to continue performing and teaching traditional and classical vocal performance. However he never lost interest in his old friends and the progress of the barbershop movement.